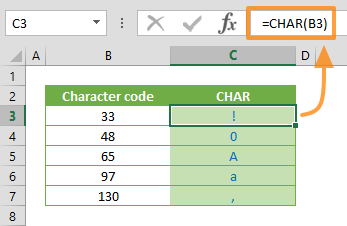 The Excel CHAR formula is a Text function that returns a character, based on the character set used by your computer. 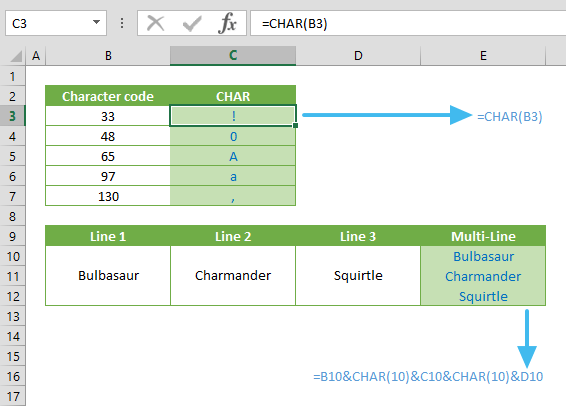 In this guide, we’re going to show you how to use the Excel CHAR function and also go over some tips and error handling methods. A number between 1 and 255 specifying the character. formula returns the “A” character. You can create a line break by pressing the Alt + Enter key combination. However, this will not work for when you want to use the outcome of a formula. The CHAR function can be used for adding line breaks (or new lines) into a string that is generated by a formula. combines the values from the three cells (B10, C10 and D10) and adds line breaks in between each value. Remember to enable the Wrap Text option in the formula cell. Otherwise, Excel will display all values in a single row. If you are using Mac, use =CHAR(13) instead. Windows and Mac OS use different character sets. See the Tips section below for more details. Add 32 to the code of an uppercase alphabetic character to switch it to lowercase. For example, 65 = A, 97 = a. Use the CODE function to return the code number of a character. The CODE function is essentially the opposite of the CHAR function. The function returns a #VALUE! error if the value is a string, or the reference cell is empty.